WASHINGTON — Blue Origin’s New Shepard suborbital vehicle launched on its tenth test flight Jan. 23 as the company edges closer to flying people into space. The vehicle, flying a mission designated NS-10, lifted off from Blue Origin’s test site in West Texas at 10:05 a.m. Eastern. The capsule reached a peak altitude of 106.9 kilometers before landing 10 minutes and 15 seconds after liftoff, about three minutes after the vehicle’s propulsion module made a powered vertical landing. The New Shepard capsule carried eight experiments provided by NASA’s Flight Opportunities program, which arranges flights of science and technology demonstration payloads on suborbital vehicles, high-altitude balloons and parabolic aircraft flights. The experiments include microgravity research in topics from fluid dynamics to planetary science, as well as payloads to measure conditions in the vehicle. The launch was scheduled for last month but postponed because of problems with ground infrastructure at the launch site. Original plans called for the flight to carry nine experiments but one, the Suborbital Flight Experiment Monitor-2 payload from NASA’s Johnson Space Center, was not included on the final manifest released by the company, which did not disclose the reason for the change. The flight was the fourth for both this capsule and propulsion module, and the first since a July 2018 test flight that demonstrated the capsule’s abort motor. While these vehicles are intended for use only carrying payloads, a new propulsion module rated for human spaceflight was shipped by Blue Origin in late 2018 to West Texas. “Our next milestone is taking people into space,” said Ariane Cornell, head of astronaut strategy and sales at Blue Origin, during the webcast. The next capsule to be delivered to the test site from the company’s factory in Washington state will carry people, she said. Blue Origin, the commercial space company founded by Amazon billionaire Jeff Bezos, launched a package of NASA experiments to the edge of space Wednesday from West Texas with a suborbital New Shepard booster, then successfully recovered the reusable rocket and space capsule a few minutes later. The single stage rocket, powered by a BE-3 engine burning liquid hydrogen and liquid oxygen, took off at 10:05 a.m. EST (9:05 a.m. CST; 1505 GMT) from Blue Origin’s test site north of Van Horn, Texas, according to Ariane Cornell, a company sales director who anchored a video webcast of the mission. After more than a month of delays caused by vehicle issues and bad weather, the New Shepard climbed to an altitude of more than 350,000 feet — nearly 107 kilometers — after firing the BE-3 engine for nearly two-and-a-half minutes. 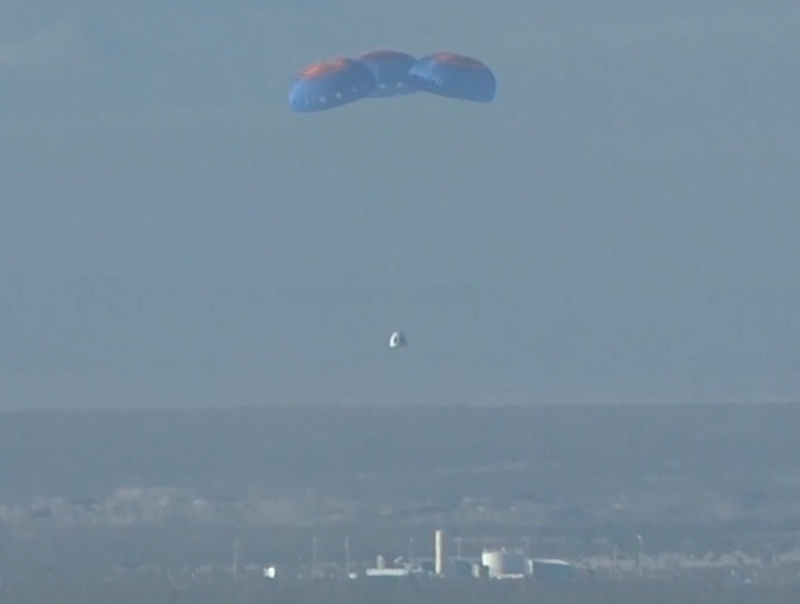 A capsule carrying the NASA research payloads separated from the New Shepard booster moments later, and the pair coasted toward apogee, the highest altitude of the mission, before descending back into the atmosphere. The booster deployed air brakes to slow its descent, then reignited the BE-3 engine and extended landing legs to touch down on a landing pad around 2 miles (3 kilometers) from its launch location at the sprawling West Texas test site owned by Bezos. A few minutes later, the capsule parachuted to a landing nearby to conclude the mission, which Blue Origin said lasted around 10 minutes, 15 seconds, from liftoff to capsule touchdown. Wednesday’s launch was the 10th flight of Blue Origin’s New Shepard rocket, and the fourth launch and landing by the reusable propulsion module currently used by the company. The first New Shepard was lost in a landing accident in 2015, and the second unit has been retired. A fourth New Shepard rocket, designed for human flights, is undergoing flight preps at Blue Origin’s facility in West Texas, officials said. Blue Origin is taking a step-by-step approach to preparing for flights with passengers. The company’s target market for suborbital flights includes wealthy space tourists and working scientists. Cornell said Blue Origin plans to be ready to carry humans to space by the end of this year. “We’re aiming for the end of this year — by the end of this year — but as we said before, we’re not in a rush,” she said in the webcast of Wednesday’s launch. “We want to take our time. We want to do this right. 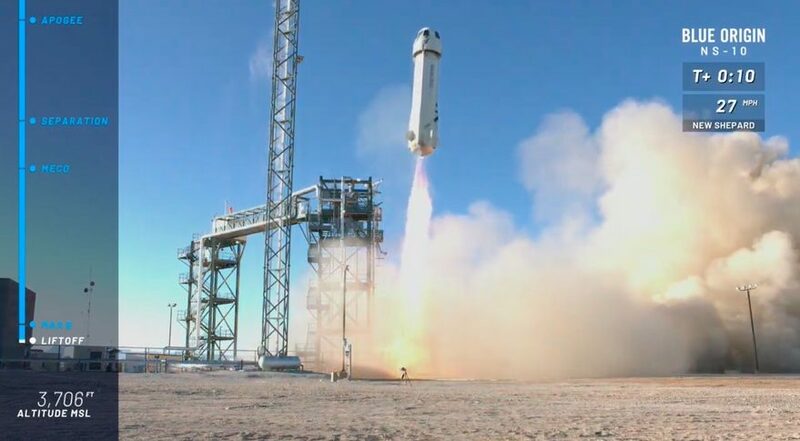 “As you know at Blue Origin, we take the conservative approach, we are patient, we want to build for you guys the safest and most reliable human flight system,” she said Wednesday. Blue Origin’s main competitor in the suborbital space tourism market, Virgin Galactic founded by Richard Branson, has hundreds of would-be space fliers who have paid deposits on $250,000 tickets to ride aboard the SpaceShipTwo rocket plane. Wednesday marked Blue Origin’s first flight since July 18, when engineers demonstrated the vehicle’s high-altitude abort capability. The capsule’s solid-fueled abort motor fired to quickly accelerate the craft away from the rocket, simulating the escape maneuver passengers would use to quickly get away from a failing booster at high altitude. Blue Origin accomplished a lower-altitude abort demonstration in 2016. Cornell said Wednesday’s launch, designated New Shepard-10, followed a “nominal flight profile,” the same trajectory to be used for commercial research and space tourist flights. 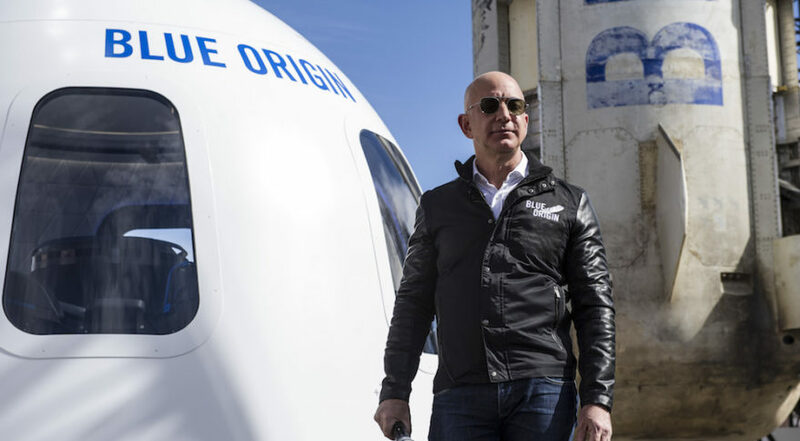 On such flights, Cornell said passengers can expect to experience three or four minutes of weightlessness, along with spectacular views out of the capsule’s six windows, which Blue Origin says are the largest to have ever flown in space. Up to six passengers will fly on a single launch. Virgin Galactic flew its air-dropped SpaceShipTwo rocket plane to the edge of space for the first time Dec. 13 with two test pilots at the controls. The SpaceShipTwo rocket plane reached a maximum altitude of 51.4 miles, or 82.7 kilometers, on last month’s test flight, above the 50-mile mark used by the U.S. Air Force and the Federal Aviation Administration to determine who gets awarded astronaut wings. Blue Origin’s New Shepard flights reach the 100-kilometer (62-mile) Kármán line, the internationally-recognized boundary of space. Last month’s SpaceShipTwo test flight was the first time a U.S. vehicle carrying people has flown above 50 miles since the last space shuttle mission in 2011. Virgin Galactic plans to move SpaceShipTwo operations from a test site at the Mojave Air and Space Port in California to the new Spaceport America facility in New Mexico for regular commercial flights later this year. Eight NASA-sponsored research experiments flew on Wednesday’s New Shepard launch, meaning Blue Origin is already earning some revenue as New Shepard test flights continue preparing for crewed flights. The experiments include payloads from universities and NASA centers examining the behavior of a “green” non-toxic fuel in microgravity, demonstrating a way to measure fuel levels in microgravity using sound waves, testing technology to cool electronics in space, and measuring the naturally-occurring electromagnetic fields inside and outside the spacecraft. Other NASA payloads include a pair of planetary science investigations from the University of Central Florida to help scientists better understand how dust particles on other planets might respond to human and robotic contact, and to evaluate the performance of an asteroid sample retrieval mechanism in a low-gravity environment. New Shepard also carried to space Wednesday an experimental imager that could be used to support future biological investigations on suborbital rockets, and a vibration isolation platform to protect experiments from the shaking and forces encountered in flight. “These NASA supported experiments will help advance in-space propulsion technologies, habitation systems, science instruments and other capabilities crucial for exploration,” said Jim Bridenstine, NASA’s administrator. NEW YORK — As Blue Origin prepares to start flying people on its New Shepard suborbital vehicle, the company’s founder says the altitude the vehicle can reach will put it at an advantage over Virgin Galactic’s SpaceShipTwo. In an on-stage interview with SpaceNews during a Wings Club luncheon here Feb. 20, Jeff Bezos reiterated statements made by other Blue Origin executives that the company expects to start flying people on New Shepard later this year. As Blue Origin prepares to start flying people on New Shepard, Virgin Galactic is also edging closer to commercial flights of its SpaceShipTwo vehicle. The latest test of the suborbital spaceplane, scheduled for Feb. 20 from Mojave Air and Space Port, was postponed because of winds. The company said it will try again Feb. 22. Bezos, in the interview, pointed out the altitude difference between the two vehicles. 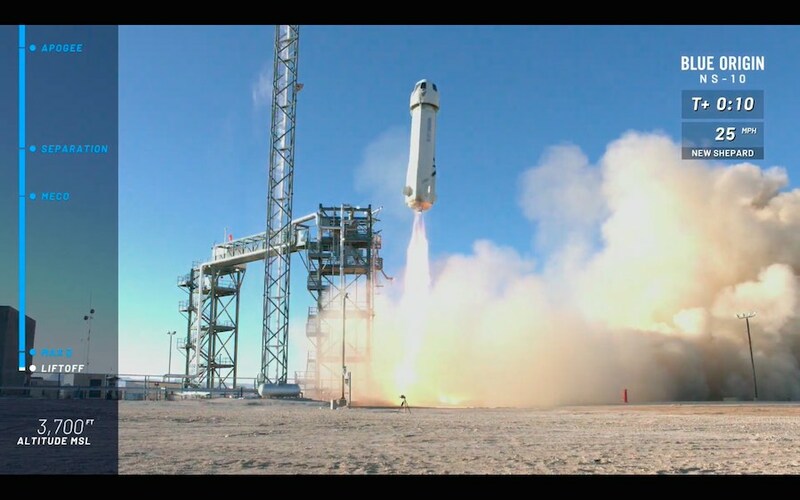 New Shepard has typically exceeded 100 kilometers, an altitude known as the Karman Line, on its test flights. SpaceShipTwo reached a peak altitude of 82.7 kilometers on its most recent test flight Dec. 13, its first above the 50-mile boundary used by U.S. government agencies to award astronaut wings. In an interview that also touched on the company’s New Glenn orbital launch vehicle and the BE-4 engine that will power it, Bezos explained how New Shepard will fit into that overall development plan. “The strategic objective of New Shepard is to practice,” he said. “A lot of the subcomponents of New Shepard actually get directly reused on the second stage of New Glenn.” That includes, he noted, a variant of New Shepard’s BE-3 engine that will be used on the second stage of New Glenn. He also tied New Shepard to the early barnstorming era of aviation, where such flights built up expertise to allow the aviation industry to grow in the early 20th century. “That’s going to be our barnstorming,” he said of New Shepard. Strona wygenerowana w 0.166 sekund z 24 zapytaniami.